MINISTER FOR FINANCE Paschal Donohoe has said he is willing to introduce stronger legislation to punish bankers for behaviour that causes harm to consumers. 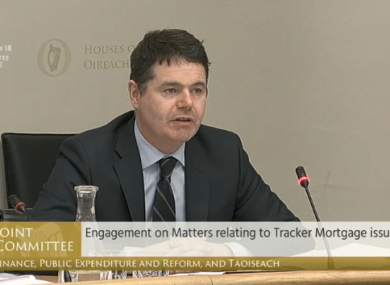 The minister was speaking to the Oireachtas Finance Committee about the tracker mortgage scandal, which saw more than 30,000 customers overcharged by their banks when they were either denied a tracker rate of interest on their mortgage or charged the wrong interest rate. The Central Bank is currently conducting an investigation into the scandal. The banks who engaged in this behaviour – after a push from the regulator and the government and months of negative publicity – are working now to pay back and compensate impacted customers. Donohoe told the committee that he recognised the harm and stress that had been caused by what he described as the “appalling behaviour” of the banks. Sinn Féin’s Pearse Doherty told him a scandal such as this will happen again if there are no serious consequences for the people who were responsible for the mass overcharging. “Bankers are getting away with it, getting away with the biggest theft in the history of this State,” he told him. He said it was time to forget about political allegiances and for all parties to work together to ensure that citizens were put first. “They need to know that there are repercussions for their actions,” he said. Doherty said this behaviour would be considered theft in other countries, such as Iceland. He also informed the minister that he will be publishing legislation that would see bankers go to prison for this kind of treatment of customers. Although Donohoe said he wanted to allow the Central Bank to complete its work before taking action in this area, he noted recent comments by the regulator in relation to stronger powers that would allow it to more rigorously pursue bankers over wrongdoing. In response to a recent Law Reform Commission paper, the Central Bank recommended stronger accountability for senior managers in the financial sector and the strengthening of legislative framework to include a criminal offence of “egregious recklessness” by the people in charge of financial institutions that fail. The Central Bank expressed its support for the creation of a dedicated division within an existing criminal agency to investigate incidents of white collar crime. The minister said he was aware of the statements made by the regulator and said if the governor asks him to strengthen the Central Bank’s powers, he will legislate for that. Donohoe also confirmed to committee members that the State no longer has any public interest directors in the three banks it has a stake in (AIB, PTSB and BOI) but the government will be advertising for State nominations to the boards this year. He said none of those nominated to the boards will be former members of the Oireachtas. Email “Minister willing to bring in new laws to punish reckless behaviour of senior bankers ”. Feedback on “Minister willing to bring in new laws to punish reckless behaviour of senior bankers ”.